Andrew Kwon took this image of Jupiter on Nov. 20 from his backyard observatory in Mississauga, Ontario, Canada. 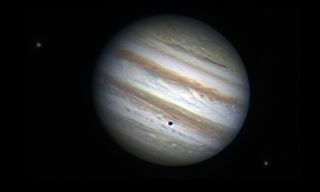 Jupiter, the largest planet in the solar system, reigns supreme in an eye-catching photo captured by a veteran amateur astronomer. The planet's icy moon Europa and volcanic satellite Io also make an appearance in the image. Astrophotographer Andrew Kwon snapped the stunning photo of Jupiter on Nov. 20 from his backyard observatory in Mississauga, Ontario in Canada. Kwon used a Celestron C11 telescope, astronomik RGB filters and ASI120mm monochrome camera to capture the photo. About 4000 red and green frames and 3500 blue frames were stacked and combined to create this final version of the image seen here. Jupiter is the largest planet in the solar system — roughly 318 times as massive as Earth and more than twice the size of all the other planets in our solar system combined. This gas giant has at least 63 moons and an enormous magnetic field. Galileo Galilei discovered Jupiter’s four largest moons, which are now called Io, Europa, Ganymede, and Callisto.